Now that the treatments were finished mom went back to work and dad's union job ended. He took a job that required him to work out of town during the week and he could come home on weekends. I went back to daycare and Mitch went to school. We had a lot of fun times as a family by attending monster truck shows, camping, riding 4 wheelers and going to the rodeo with my grandpa Walquist. 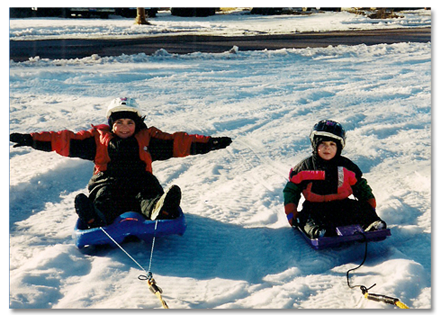 During the winter dad would pull us on sleds using the 4 wheeler. I had a sled with hand breaks and I would pull hard on them just to spray snow at Mitch on the sled next to me. It was so much fun. 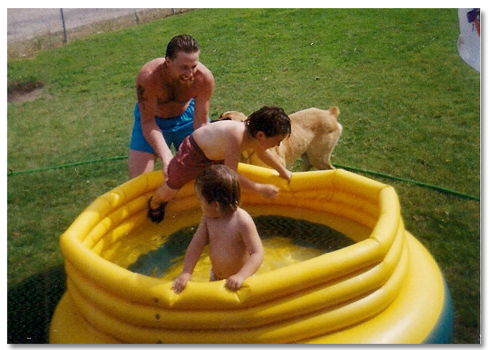 In the summer we had swimming lessons and had our own small inflatable pool in the backyard. Dad would run and jump off the deck into the pool which would make a big splash; we then would do the same. Mom would join in and we would always end up having a huge water fight in the yard and house. Dad would ride to work with a co-worker named Bryan. They worked with a rowdy construction crew and something dad noticed about Bryan was that he worked with them, but didn't join in the rowdy activities. He treated everyone with respect and didn't judge their choices. While they rode in the car Bryan always listened to a Christian radio station and dad really enjoyed the music. He had questions for Bryan and he would always answer them but was never pushy. One weekend when dad was home he told mom all about Bryan and wanted us to meet their family. He said that Bryan had invited us to go to church with them and mom instantly objected. She didn't want anything to do with church, but she did want to meet Bryan and his family because she had heard such good things about them. Bryan and his family stopped by and they were genuinely wonderful people, so kind and sincere, just like Dad had told mom. Mom and Bryan's wife Ellen talked about church and Ellen invited us again. Mom shared her objections and Ellen was very patient. Finally the only excuse mom had was that we didn't own church clothes. Ellen told her that was no problem. At church you come as you are, everyone is welcome. We went to church with them on Sunday and both mom and dad were amazed at how warm and inviting everyone was. The music was incredible and the message was just what mom and dad needed to hear, they were loved by God. Mom said that the peace she had felt when the men prayed at the hospital was just as strong during the church service and she wanted more. Mitch and I attended the kid's service and had a lot of fun. Afterwards the pastor asked if we would be returning and we all said yes. Our family started attending church regularly and we asked Christ into our lives. We knew that the Lord loved us, forgave us and wanted a real and personal relationship with each one of us. We also realized that in addition to our regular family we had a church family. A family that loved and cared about us like our biological families, but one that also loved the Lord and prayed that we would continue to grow in our understanding of the Bible and in our life long journey walking with Christ. The prayers that those two men prayed were like seeds planted in our lives. Bryan and Ellen sharing their faith, love and invitation were like buckets of water for the seeds. Over time the Lord made it all come together and a new faith was grown. Realizing that the Lord was in complete control of our lives was a big help when it came time for my return visits to the hospital for scans. Each Sunday before we would leave for Salt Lake our church family would gather around us and pray for us. Mom still had anxiety about the results, but she felt a new strength from all the prayers. "But what does it say? 'The word is near you; it is in your mouth and in your heart,' that is, the word of faith we are proclaiming: That if you confess with your mouth, 'Jesus is Lord,' and believe in your heart that God raised him from the dead, you will be saved. For it is with your heart that you believe and are justified, and it is with your mouth that you confess and are saved. As the Scripture says, ' Anyone who trusts in him will never be put to shame.' "